There are more than 800 species of ticks in the world and most of them feed on animal or human blood to grow and reproduce. Ticks can spread diseases to humans and animals through their infected saliva causing diseases like Lyme disease, human ehrlichiosis and even Rocky Mountain Fever. Ticks are found on lawns and even around the house. So if you are looking for best ways to get rid of ticks around the house, we have discussed some of the top methods, remedies and steps to do so. Create tick free zones around the house by cutting wooded areas and increasing the size of your back or front yard. Spray chemicals around the wooded areas to deter tick carrying wildlife. Try and keep the grass mowed down to a height of 3 inches or less. Anything more than this height invites tick breeding grounds. Keeping grass short will also decrease humidity levels near the ground to curb ants and other pests upon which rats and mice feed. Shorter grass will also reduce nesting spaces for the pests. Reduce clutter around decks and porches and remove weeds and dried grass, leaves and twigs regularly. If you have dense plant beds or creepers and vines like ivy etc running on your house walls or fences -then trim or reduce them. This is one of the most important steps how to get rid of ticks around the house. Remove wood piles as far away from the house as possible. They are ideal breeding grounds for chipmunks, raccoons etc which harbor ticks on their bodies. Also move birdfeeders, trash bins, birdbaths and children’s wooden playsets far from the house as they invite rodents and provide safe areas for ticks to hide in. Avoid keeping trash bins open-use tight lids as far as possible and avoid keeping any food-in particular pet food outdoors. This invites wild animals and transfers ticks around your home and yard. If you have a large deer population in your area, then make sure you reduce the plants in your yard. Deer love feeding on certain plants and this can bring in deer ticks inside your property. Azaleas, rhododendrons and other succulent plants are some varieties upon which deer feed-so avoid planting these. Call your local nursery to find out other steps you can take to prevent deer from coming in your backyard. In some cases, a fence may be necessary to keep deer as well as other neighborhood pets from your yard. For keeping deer out, go for 10 foot high fences or electrified fencing. These are necessary steps when looking for ways to get rid of ticks around the house. Tick infestation can also occur indoors. It is important to control ticks on the pets before seeking solutions for how to get rid of ticks around the house. Shampoos, sprays, tick collars and spot treatment are some proven tick control techniques for getting rid of fleas and ticks on cats and dogs. Do vacuum the house thoroughly and wash all fabrics and pet bedding in hot water and detergent. Discard the vacuum bags immediately. 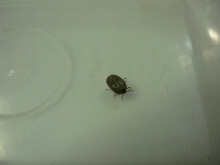 Apply an approved pesticide for chemical control of ticks inside the house. Groom your pets thoroughly to catch ticks on time so that their population does not grow. Designate specific sleeping areas for pets. Inspect these from time to time for ticks. Keep pets off your furniture and beds, since ticks can hide in cracks and crevices here and rapidly multiply. If you are an outdoor person who loves nature walks, particularly in areas known for ticks, then inspect your body and clothing for ticks once you come back home after a hike. Seek your veterinarian’s advice before using tick products like shampoos or sprays on the pets. Some approved chemical tick control products include Carbamates (Carbaryl) and Pyrethroids (Permethrins). Despite your best efforts in seeking the best ways to get rid of ticks around the house, it may be impossible to keep these pests off your yard and home. It is therefore important to protect yourself and your family members as well as your pets by using appropriate protection. For example, you could wear long sleeved shirts, pants and also spray the exposed parts of your body and clothing with DEET based insecticides. You can also use permethrin sprays on your pets. Follow these instructions and best ways to get rid of ticks around the house to keep your property free from ticks.